For thirty-five years now I've been in wastepaper, and it's my love story. Hanta is long-winded like the other protagonist of the book I've read by Hrabal, I served the King of England (which I liked more), his words flow in a very similar way of a stream of consciousness. In fact the tone and the uninterrupted flowing remind me of a painful, oscillating, even rocking memory, dedication to his life with books, with the mices that were invading him, with her gypsy so similar to the vacant mices and so on. But if Fahrenheit has moved me, Too Loud a Solitude leaves me without particular impressions, and I'm already sure that I will forget the details soon. It's again the same story: everyone loves it and phrases it but me, and I want really to be part of the hype but I'm cut off. 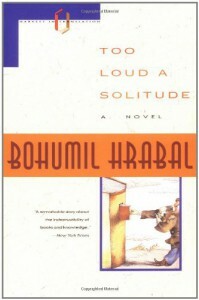 Given its features, I could say that it's all a matter of personal reception: surely it is evocative, Hrabal himself has defined the story as a ballad in prose, and poetry involves the most subjective appreciation of the literary genres.